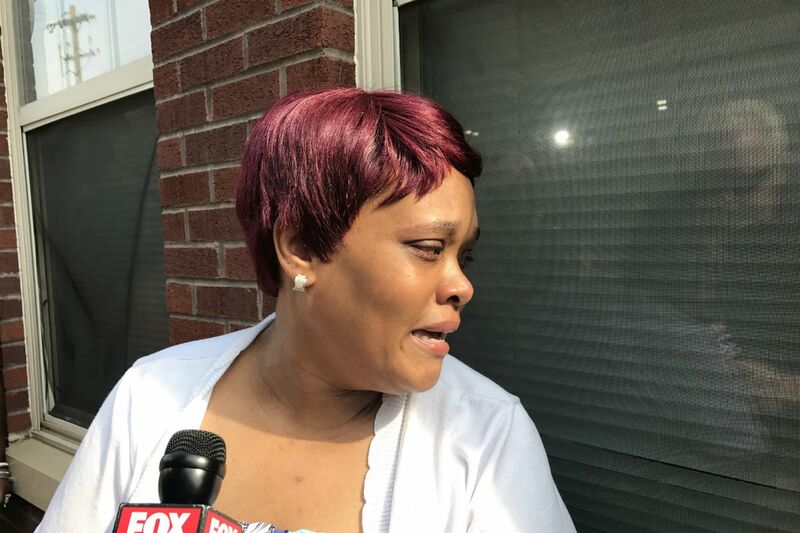 Alissa Jackson, mother of Symir Walker, weeps as she speaks to reporters outside her South Philadelphia home on Monday, June 18, 2018. A double shooting in South Philadelphia on Friday night that killed a 16-year-old boy and wounded a 12-year-old boy appears to have been a targeted attack and may be tied to gang activity, police said Monday. The shooting occurred about 10:30 p.m. on the 1200 block of Fitzwater Street in South Philly's Hawthorne section. Asked at a news conference whether it was a targeted attack, Homicide Capt. John Ryan said: "We believe so, yes. It wasn't at random. There is some gang activity on 13th Street we believe it may be tied to." The slain teen's mother and friends identified him Monday as Symir Walker. Allissa Jackson, 43, the teen's mother, said outside her South Philadelphia home Monday afternoon that she didn't believe her son was an intended target. "It was just a random act of violence," she said. She also disputed the police allegation that the shooting may be linked to gang activity. "There is no gang out here, and my son is not affiliated with any gang," she said. She said her son had just finished ninth grade at KIPP DuBois Collegiate Academy in Parkside. He had been playing basketball Friday night at the Palumbo Recreation Center on the 900 block of Fitzwater Street, she said. About 10:15 p.m., they spoke by phone and her son told her he was going back to the playground to pick up a hat he left there, she said. Then, a few minutes later, she said, "I heard the parade of gunfire." Jackson, who was outside on her steps, called her son's phone. She said a friend of her son's told her that her son had been shot. She then ran from her home to the shooting scene, about three blocks away. Police took her son to Thomas Jefferson University Hospital, in Center City, where he was pronounced dead a short time later. "Senseless, stupid," Jackson said of the shooting, crying as she spoke to reporters. Family members and friends who were carrying blue and white balloons were preparing for a vigil that was to be held Monday night near the victim's home. The younger boy, who was shot in his left leg, was friends with Walker, Ryan said. He also was taken to Jefferson, where he was in stable condition. He has since been released from the hospital, said Ryan, who did not release the boy's name. He said the shooter or shooters fired "at least 19" rounds. Police have no suspects and are trying to find a motive and obtain video. "Neither kid had any prior contact with law enforcement," Ryan said. Authorities ask that anyone with information contact the homicide unit at 215-686-3334. A $20,000 reward is offered for information that leads to an arrest and conviction.